KOKOMO, Ind. — Eva White looks forward to interviewing one of her most admired writers this summer, with help from two Indiana University grants. Eva White leads her class in discussion. White, associate professor of English at IU Kokomo, will interview Roddy Doyle, and write the first chapter of her book, Who is Irish? : Roddy Doyle's Hyphenated Identities, supported by two New Frontiers in the Arts and Humanities grants. Her project is one of 22 supported so far this year by the New Frontiers program. She is grateful IU supports faculty research, and makes it possible for them to take a short time out of the classroom to do so. "It's very encouraging and wonderful to have IU provide us with internal grants," White said. "There are not many grants out there to write books, at least not in humanities. These grants allow me to be mentally free to think about this project. There is not much research out there about Roddy Doyle. It will be incredibly exciting to meet him, and to ask him questions about the topics in my book." Chancellor Susan Sciame-Giesecke said White is a great example of IU Kokomo's faculty scholars, whose teaching and research attract students to the campus. "Many of our students enjoy Eva's award-winning teaching, and benefit from her research," she said. "We have an international faculty who provide our students with a global perspective, as they prepare to live and work in a diverse world." The grants allow White to research in Ireland this summer, studying how the culture and national identity has changed since the 1990s, when the country's rich economy began attracting many immigrants. Doyle's short story collection The Deportees documents that experience. 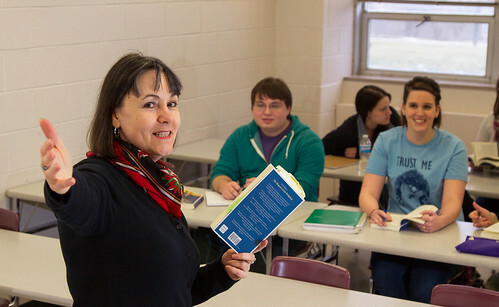 White began including his literature in her classes in 2008. She will present her work at a conference while she is there, in addition to her interview with the Irish author. White plans to design a class at IU Kokomo based on her research for the first chapter in her book, which compares and contrasts the city of Dublin as documented in James Joyce's The Dubliners, published in 1914, and The Deportees, published in 2007. "Both are chroniclers of their Dublin, and explorers of the Irish psyche," she said. "Joyce was disgusted with Ireland, and the paralysis that had enveloped the city. Doyle gives us a very different Dublin, multicultural, vibrant, wealthy, lots of optimism with race relations. Each of them produced work that can be considered historical documents of a sort." In addition to her research honors, White has won numerous teaching awards, including IU's Herman Frederic Lieber Memorial Award for Teaching Excellence and the Kokomo campus' Trustees' Teaching Award. "It is an honor for Eva to be chosen to receive these grants," said Scott Jones, dean of the School of Humanities and Social Sciences. "The grants recognize her skill as a scholar, and the importance of her research." The New Frontiers in the Arts and Humanities program's objective is to support IU faculty members in the initial stages of path-breaking and transformative programs of scholarly investigation or creative activities.